The Department of Justice released a heavily redacted version of the FISA warrant used to surveil 2016 Trump campaign volunteer Carter Page in July 2018. The warrants revealed that the DOJ and FBI falsely attested to the FISA court not once, not twice, not thrice, but four (!) separate times that Steele was not the source of Isikoff’s September 23 article, which DOJ used to corroborate claims from Steele’s dossier. In fact, Steele was the only source. The dossier was bought and paid for by the Democrat party and Hillary Clinton and passed through the DOJ to the FBI who used this political document that was never verified — because it is completely false — by the FBI before they used it to spy on Carter Page, the Trump campaign and the Trump family. Former FBI Director James Comey, Deputy Attorney General Rod Rosenstein, former Deputy Director of the FBI Andrew McCabe, and former Attorney General Sally Yates were all required to sign off on the FISC warrant application before it was reviewed and ultimately approved. They all signed off on a FISA warrant to spy on Carter Page knowing it was a complete lie. 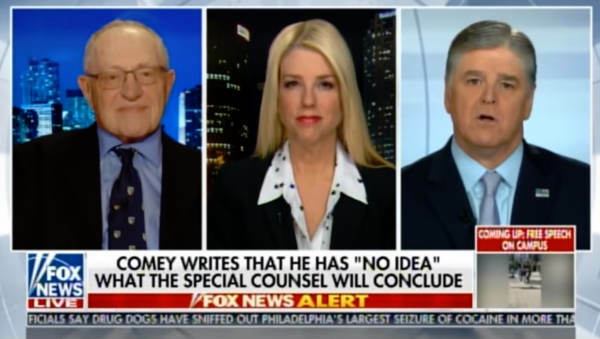 On Thursday night noted law professor and author Alan Dershowitz said these individuals who pushed these fraudulent warrants to the FISA court committed fraud. Sean Hannity: We know he (Comey) signed the first warrant. And then in January he didn’t tell the court she paid for it either… Is that a fraud on the court and why three months later did he tell President Trump the opposite? Alan Dershowitz: I think it is a fraud on the court and I think the court ought to look into holding the people who misled them in contempt. The court is a trusted institution. They handle these requests ex parte.